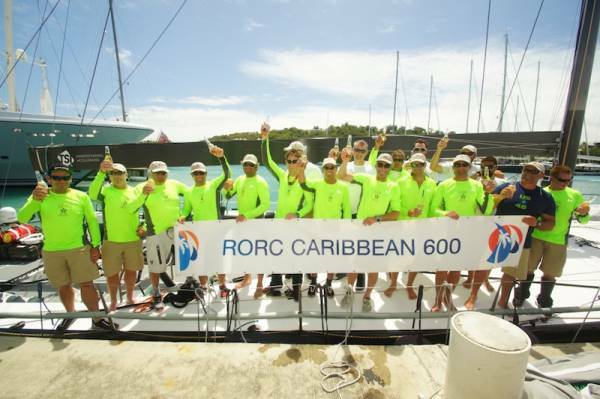 60 yachts from 11 different countries, with 682 crew from all over the world, took part in the 6th edition of the RORC Caribbean 600 and enjoyed spectacular conditions and intense competition. The start gun sounded at Fort Charlotte, high above the Pillars of Hercules, and the magnificent international fleet of yachts enjoyed a sparkling send-off with warm trade winds, Caribbean swell and brilliant sunshine. With all 60 yachts accounted for, the Royal Ocean Racing Club announces that the winner of the RORC Caribbean 600 Trophy for the best yacht, overall in IRC on corrected time, is George Sakellaris' RP72, Shockwave. The trophy will be presented to the Shockwave crew at tonight's Prize Giving held at the Antigua Yacht Club. St. John's dentist, Bernie Evan Wong said he would be back for his 6th RORC Caribbean 600 with a bigger, faster boat and Grand Soleil 43, Quokka 8 delivered, taking Line Honours in IRC Two. The first time in the six year history of the race, that an Antiguan skippered yacht has taken line honours in any class. "We pushed the boat to its limits; it was the hardest race I have done and so satisfying. The Quokka crew is very, very, experienced and although we had our differences, we all had one goal; to be the first to finish in our class and we have achieved that. It has been a privilege to sail with a truly great team and we have all contributed to our success; there is mutual respect between us all and a friendship that will last forever." Jonty Layfield's Azuree 46, Sleeper is a brand new boat taking part in its first offshore race. 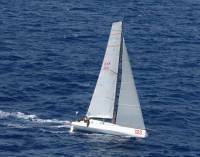 Antiguan Laser sailor, Sean Malone was on board as a principal driver for the RORC Caribbean 600. Sleeper was second in class and only beaten by an hour by the highly experienced and successful Dutch team on Tonnerre de Breskens 3, a former RORC Yacht of the Year. 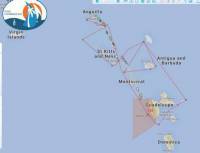 At 0800 on Day Four of the RORC Caribbean 600, 17 yachts had completed the race and six yachts had retired. George Sakellaris' American RP72, Shockwave, was the overall leader of the race for the RORC Caribbean 600 Trophy, having set the bench mark corrected time of 3 days, 4 hours 16 minutes 38 seconds with Bella Mente in second place at this time. 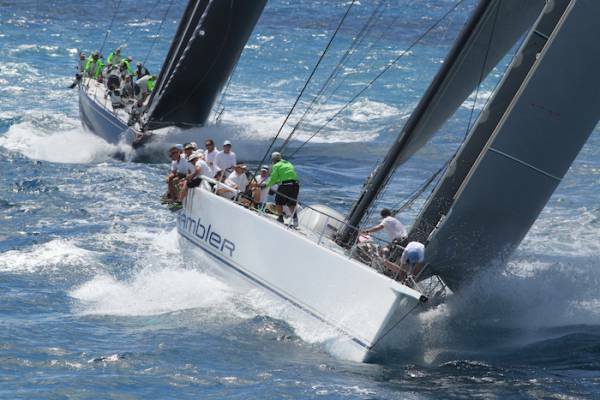 18 yachts still racing have the ability to better that time to claim the overall prize. Hap Fauth's JV72, Bella Mente, crossed the finish line in Antigua to take Monohull Line Honours for the 2014 RORC Caribbean 600 on Wednesday 26th February, in an elapsed time of 48 hours, 5 mins, 44 seconds. George David's RP90, Rambler, crossed the finish line in second place, just ten minutes later, and was followed by George Sakellaris's RP72, Shockwave, which finished third on the water and just over two minutes after Rambler. Bella Mente, Rambler and Shockwave had an intense battle for 48 hours, with the lead changing on numerous occasions around the 600 mile course. After time correction Shockwave leads the race overall with Bella Mente second and Rambler third. Shockwave must wait for more yachts to finish the race before an overall winner can be announced. Hap Fauth's JV72, Bella Mente, crossed the finish line in Antigua to take Monohull Line Honours for the 2014 RORC Caribbean 600 on Wednesday 26th February in an elapsed time of 48 hours, 5 mins, 44 seconds. The closest finish in the six year history of the RORC Caribbean 600 is playing out on the last leg of the course for the IRC Zero leaders. At 0700 on Day Three, Hap Fauth's Bella Mente, George David's Rambler and George Sakellaris' Shockwave were approaching the last island of the course in fighter formation, readying themselves for a battle royale. After exiting the Stealth Zone at Guadeloupe, the American trio, lit the afterburners, at times sending it at 20 knots of boat speed, towards Barbuda. A hair-raising reach to reach gybe, in darkness, at Barbuda and then the battle resumed as they blasted to Redonda. In the Superyacht Class it has taken an island to separate the two magnificent schooners, Adela and Athos. The 182ft Dykstra designed schooner, Adela, has chosen a conventional route by staying to the windward side of Montserrat on the long reach to Guadeloupe. However, the 203ft Hoek designed Athos has elected to go to the leeward side of Montserrat, accompanied by Italian Southern Wind 100, Cape Arrow, and RP78, Arctic Idea, which have also left Montserrat to port. 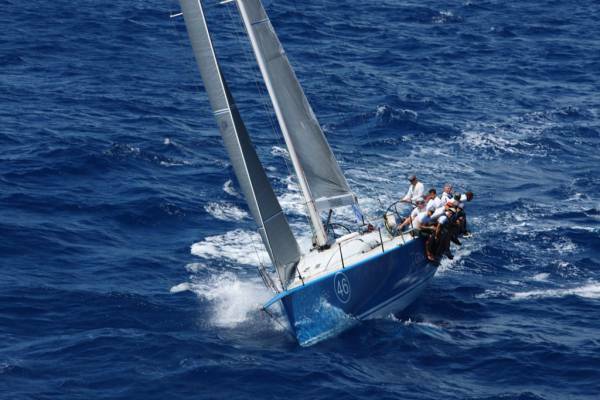 In IRC One, Piet Vroon's Ker 46, Tonnerre de Breskens 3, put the hammer down after passing St.Barths at 1100 local time. Colin Buffin's British Swan 62, Uxorious IV, was still tacking through the Anguilla Strait, as the Dutch flyer set a course for the windward side of Montserrat and took off, averaging over 10 knots of boat speed. 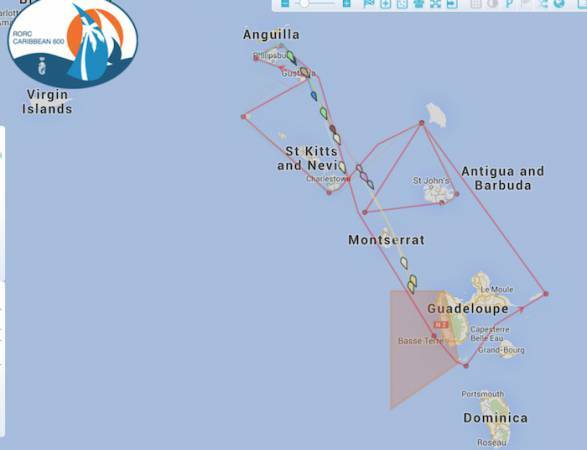 Uxorious IV took just an hour and a half to reach St.Barths but by then Tonnerre had increased their lead on the water by 15 miles. At 1700 on day 2, Tonnerre was 32 miles ahead of any other yacht in their class, and had a substantial lead after time correction. Todd Stuart's American Swan 56, White Rhino, was third on the water and in class after time correction. At 1330, the leading pack in the RORC Caribbean 600 went dark. From the northern end of Guadeloupe, at Basse Terre, until the islands of Les Saintes. Rambler, Bella Mente and Shockwave went into stealth mode. With their positions, speed and heading no longer visible, the chasing pack of yachts could not use the leaders position reports to gain information about the wind shadow behind Guadeloupe. The French island is one of the biggest in the central Caribbean and throws out a significant wind shadow.